1. Pipe was divided into ordinary steel pipe and thickened steel pipe in the standard of wall thickness and divided into spiral steel pipe and non-spiral steel pipe in the standard of pipe end formation. Specification of the pipe was expressed as nominal diameter (mm) which is approximate to the inner diameter, traditionally expressed in inches.Except from direct low-voltage transmission of fluid, Welded steel pipe for low pressure liquid delivery was also made extensive use as the original galvanized welded steel pipe for low-voltage transmission fluid pipes. 2. Ordinary carbon steel wire casing (GB3640-88) is t used in construction, installation for machines and equipment. 3. 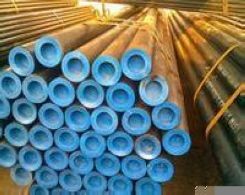 Straight seam welded steel pipes (YB242-63) is the steel pipe those welds parallel to the longitudinal steel pipe. Usually divided into metric welded steel tubes, welded thin-walled tubes, transformer cooling tubing and so forth. 4. Spiral submerged arc welded black steel pipe for high pressure fluid delivery(SY5036-83) is mainly used for transportation of oil and natural gas pipelines which uses hot-rolled steel strip coils as tube, shaped spiral in normal temperature and welding with the double - sided arc welding method. Pipe is safe and reliable as it has good pressure-bearing ability, good welding properties resulting from a variety of rigorous scientific examination and testing. Pipe has a large diameter and high transmission efficiency; it can save the laying of pipeline investments. 5. Spiral high frequency welded pipe for high pressure fluid delivery (SY5038-83) is similar with the spiral submerged arc welded steel pipe. It is also used for oil and natural gas pipelines and use hot-rolled steel strip coils as tube. What makes the deference is the use of high-frequency welding of lap joint method. Similarly, the pipe has good pressure-bearing ability and good plasticity and ease of welding and forming; after strict and scientific inspection and testing, the usage is safe and reliable. We will save the laying of pipeline investments with its factor of large diameter and high transmission efficiency as well. 6. The general spiral submerged arc welded steel pipe for low-voltage transmission fluid (SY5037-83) is generally used for low-voltage transmission fluid such as water, gas, air, steam. etc. which use a hot-rolled steel strip coils for the tube, making spiral shape under normal temperature and welding with the method of double - sided arc welding. 7. Spiral high frequency welded API steel pipe for low-voltage transmission fluid (SY5039-83) is a hot-rolled steel strip coils for the tube, often warm spiral shape, using high-frequency welding of lap joint welding method for spiral high frequency welded steel pipe for low-voltage transmission fluid. 8. Spiral weld steel pipe pile (SY5040-83) is a hot-rolled steel strip coils for the tube, often warm spiral shape and are made by double submerged arc welding and high frequency welding, used in civil engineering and building structures, docks, bridge base piles with steel pipe.